Shortly after the Pantera entered production, DeTomaso introduced the near-standard Group 3 competition version. This was followed by the more substantially modified Group 4 version, which also debuted in 1972. 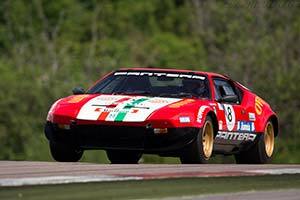 Tasked with the development of the Group 4 Pantera was British engineer and driver Mike Parkes, who had done much the same at Ferrari for many years. As per the regulations, the production Pantera's unitary chassis was retained. The car's double wishbone suspension was substantially modified to improve the geometry for track use and make room for larger and wider wheels. The Koni shock absorbers and anti-roll bars were fully adjustable. One of the reasons to fit larger wheels was to free up room for bigger, ventilated disc brakes, supplied by Girling. A quick-ratio steering rack was also added. The steel Pantera shell was stripped from all unnecessary components and the separate panels like the doors and engine cover were replaced by aluminium examples. To further reduce weight, circular holes were cut in the chassis where possible and plexiglass windows were also fitted. The Group 4 Pantera could be easily recognised by the wider wheel arches required to clear the big wheels and tyres. The stripped out DeTomaso tipped the scales at barely over 1,100 kg. Ford had been one of the instigators and main backers of the development of the road-going and Ford-engined Pantera, which it hoped would boost the appeal of the entire Ford range in North America. The Blue Oval, however, seemed to have little interest in a competition program and was unwilling and/or unable to supply a suitable engine. Instead, DeTomaso had to turn to a private engine builder, Bud Moore, who was based in the United States.